Laurie Lawrence provides an interesting article on swimming toys. Toys can be a very useful tool for a swimming lesson. Young swimmers love using toys in their lesson and they can be a huge help for swimming instructors and parents. Toys come in a variety of shapes, sizes and colours. Swimmers are limited only to their imagination for toys and their uses. Here are some suggestions for using toys within a lesson. There are a multitude of toys out there available to purchase for swimming lessons. Some toys are created specifically for swimming lessons, others can be found in your local store and will work well for learning experiences. Quick drying toys are better for hygiene and storage. Ensure toys are small enough to fit in young swimmers hands and light enough for small hands to lift and manoeuvre. Bright colours are easily spotted in the water and a big hit with swimmers of all ages and abilities. Bright colours are easy to spot & can save lives. Ensure toys are regularly cleaned and changed to keep germs at bay. If toys are changed around often it also keeps swimmers imaginations engaged and excited. Use a non-toxic cleaning agent, as toys will end up in mouths! Ensure any water is squeezed or emptied out of toys. Store toys in an open basket or in an area where they will dry easily. When using toys in a swimming lesson ensure that they are being used with a swimming related purpose. Swimmers should paddle towards a toy and then pick it up as a reward. Parents can place the toy on the water and swimmers can kick towards it to enhance kicking skills. Swimmers can hold a toy above their face when back floating for distraction and engagement. “Swimmers should never just hold a toy in their hand and swim with it – this isn’t promoting good swimming practice. Instructors should use their imagination and prepare their lessons so that toys are useful to their teaching – not a hindrance to the group”. There are many types of toys for use within a swimming lesson. These include but are not limited to mats, slides, kickboards, hoops, noodles, balls, cars, dive rings and puppets. 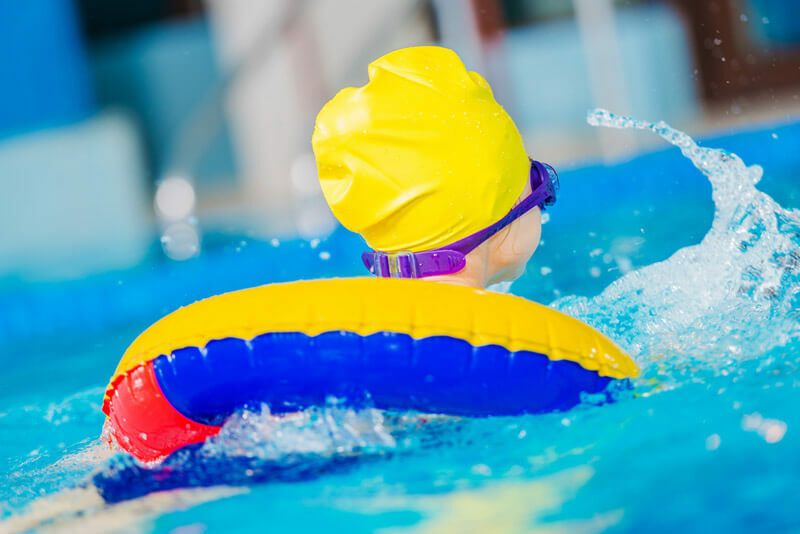 Instructors should be able to run an effective swimming lesson with and without toys and educate parents of appropriate use of toys within the lesson. Swimmers of all ages can benefit from the use of toys within the lesson. It’s important that instructors plan well for their use and constantly review and reflect on how toys affect the flow of their lesson. What experiences have you had with using toys in your lesson? Any favourite toys that you’ve found in your teaching?